Why Choose FOCUS for LED? FOCUS’ proprietary LED technology is superior to other exterior LED lighting products because of our ability to match the warm white color of halogen bulbs and our consistent light output over a wide range of voltages. With 4 different types of technologies; Retrofit, LED Modules, Flat Panel LEDS and LED Strips, FOCUS offers you more LED solutions than anyone else. No special installation or wiring is required with FOCUS Plug & Play LEDS. It is as easy as changing the light bulb. FOCUS LEDS are manufactured to our specification for a consistent color range of 2700K – 3000K. We offer a complete line of LED products including fixtures, light sources and transformers. 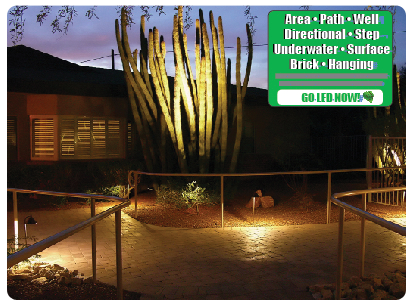 FOCUS LEDS are designed to be used in outdoor environments in any climate as well as indoors. Long Term Cost Savings – LEDS on average use 75% less energy than traditional incandescent or halogen bulbs. Have More Fixtures and Use Less Power – FOCUS LED transformers are smaller so they use less power and are designed to allow for 4 to 5 times more fixtures per run. FOCUS LEDS offer 40,000 to 50,000 hours average life compared to 2,000 hours for a regular halogen bulb. Not having to replace halogen light bulbs frequently will save you both time and money. Environmentally Friendly – LEDS are mercury free.